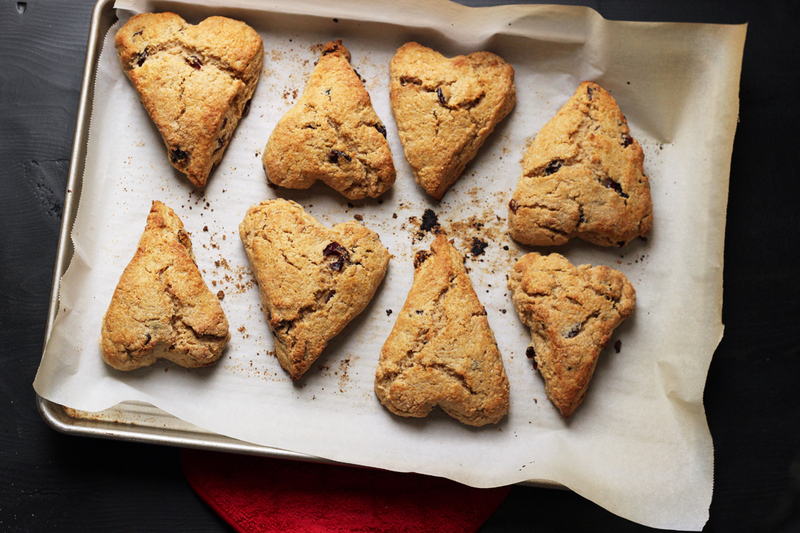 Bake someone happy with these easy Cranberry-Orange Scones. Sweet cranberries, orange zest, and whole wheat pastry flour, not to mention ample butter, make for a divine weekend treat! Scones are kind of my thing. I can’t remember ever having them as a child, but once I grew up and went to college in Santa Barbara, they became my thing. Laura Ashley was, also, for a time, but I’ve moved on. Lace doesn’t do much for me, but scones do! 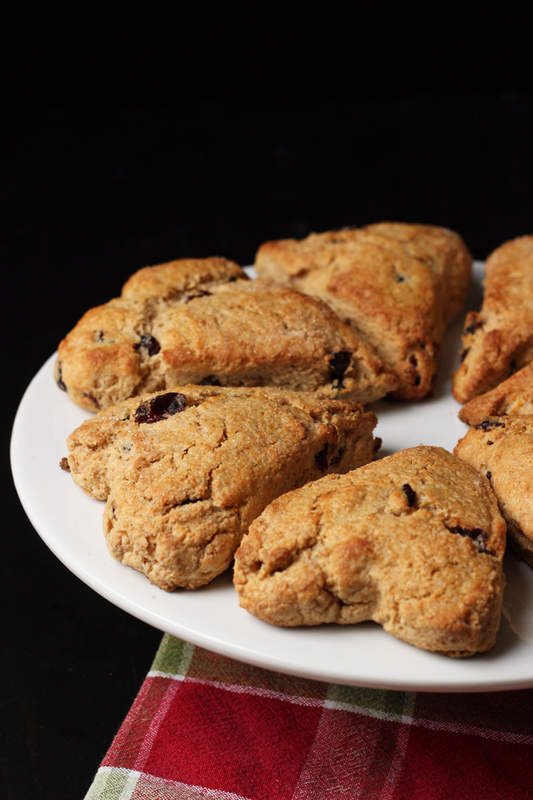 In fact, when I was writing my first cookbook, I kinda had to hold back on the scone recipes. As it is, there are four scone recipes in that book! Only one scone recipe in Good Cheap Eats. But, if I had my way, there would be dozens! 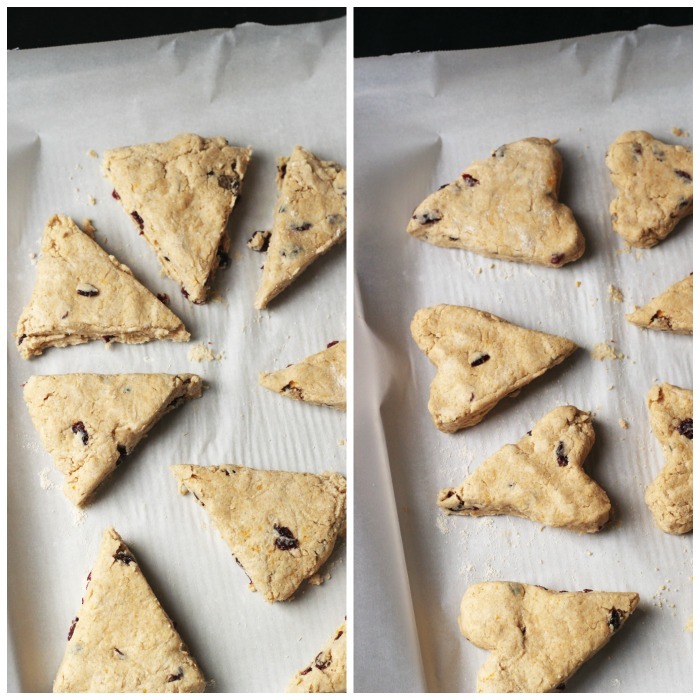 Scones feel fancy, but are incredibly easy to prepare. You don’t need any fancy ingredients. Heck! Depending on the recipe, you don’t even need an egg! My favorite scones are light on the sugar and heavy on the flavor, usually from fruit or chocolate. This particular recipe is a riff on one my friend Jessika used to make growing up. I subbed whole wheat pastry flour and switched out the buttermilk for yogurt. I also tweaked the fruits included. Lately I’ve been trying to switch us back to whole grains, so whole wheat pastry flour is my preference for this recipe. It most closely resembles the texture of unbleached all-purpose flour. If you can’t find that easily or in your budget, you can use white whole wheat flour which is a great option as well. Buying in bulk – It’s rare that I would buy a small package of dried cranberries. I usually buy the ginormous bag at Costco. I also have gotten into the habit of buying cases of flour from Bob’s Red Mill. In a large bowl or the bowl of a food processor fitted with a metal blade, combine the flour, 1/3 cup sugar, baking powder, baking soda, salt, and cinnamon. Mix well. Add the butter cubes and cut them in with a pastry blender, or if using the food processor, pulse until coarse crumbs are formed. If using the food processor, transfer the mixture to a large bowl. Stir in the cranberries and orange zest. In another bowl, whisk together the milk and yogurt until smooth. Add this to the dry mixture, folding until a stiff dough is formed. Turn the dough ball out onto a lightly floured surface. I simply do this on the prepared baking sheet. Knead just until the dough holds together. 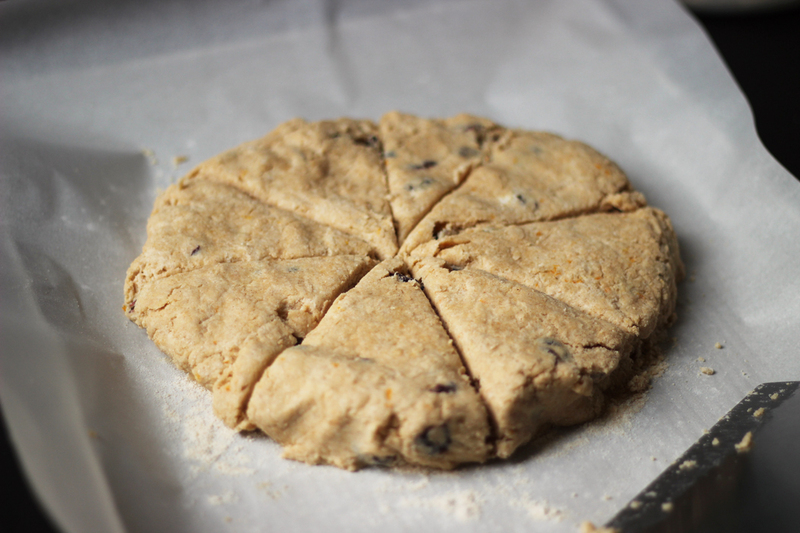 Pat the dough into a large circle and cut into wedges. Sprinkle heavily with sugar. Lay the wedges out on the prepared baking sheet and bake in the oven until golden, 12 to 15 minutes. Cool on a rack and serve. If freezing: Freeze unbaked scones on parchment covered tray until firm and then place them in a ziptop freezer bag in the freezer. Bake from frozen, adding five minutes to baking time. Completely cooled scones can also be frozen in a ziptop freezer bag. Thaw these, wrapped, on the counter, before serving. I have plain Greek yogurt. Would I need to thin it out a little with some milk or would that still work okay? I’ve done that just by eyeballing the consistency, with good results.